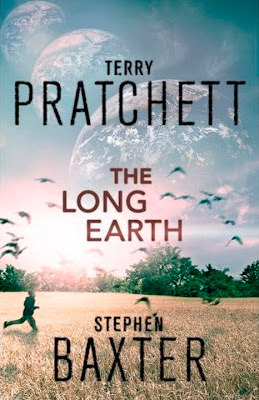 It was announced in the summer of 2010 that Terry Pratchett and Stephen Baxter would be teaming up to write at least two novels in a series with the first being titled The Long Earth, which uses the trope of parallel earths. Divergent Earths is a trope I never seem to tire of given we generally get to see so many visions of a slightly altered Earth and how they came to be that way. And you just know Pratchett will bring the humor. One of Pratchett's longtime weaknesses has always been his the Science part of Science Fiction, as is very evident in his first novel Strata so bringing Baxter in to better handle that should certainly make this a smoother ride. From the info that has been released so far the idea for the story is very much Pratchett's and has been in gestation for decades now. The above is the UK cover, which is pretty but doesn't seem like a Pratchett novel. Both a UK and a US blurb have been released and they are quite different so both are included below. The Long Earth will be released June19th in the US and the 21st in the UK. Larry Lynsey is a recluse. Aggressively protective of his singular solitude, he has searched long, far, and wide to find the perfect isolation. Deep in one of the farthest regions in Long Earth—a series of parallel worlds that become increasingly un-Earthlike with distance—in the region known as the High Meggas, the curmudgeon has found his Eden. He isn’t just the only living person on the planet; he is, in fact, the only person on the closest ten planets. It would take a ridiculously long time to reach him even if anyone tried. Life for Larry is exactly how he likes it. Unfortunately, Larry only thinks he’s alone . . . Hapless travellers Anna Shea and Seven Valiente must have taken a wrong turn at a wrong star somewhere in the back of beyond deep space and have now gotten themselves stranded in the High Meggas. Larry’s High Meggas. For the likes of the hermetic Larry, three is way too big a crowd, accidental tourists or not. Which means, he’s got to do something about them. Which means, this being a Terry Pratchett story, hijinks, mishaps, and hilarity will ensue. 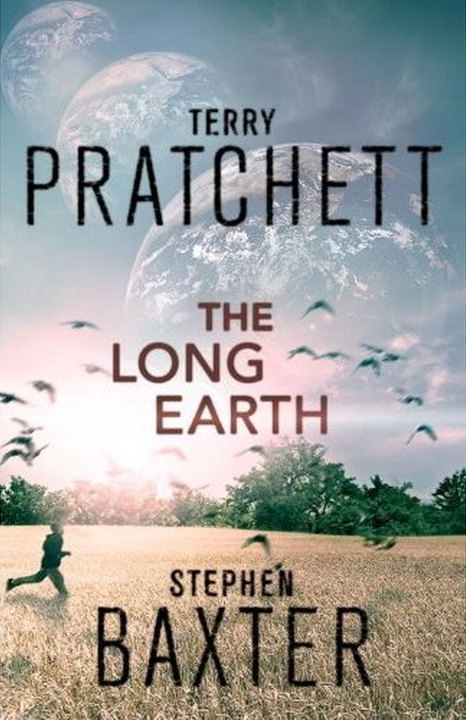 Infused with Pratchett’s subtle satire and vibrant, believable world-building and with award-winning author Stephen Baxter’s bold speculative insight, The Long Earth is dazzling feat of skill and imagination sure to enthrall fans old and new. 1916: the Western Front, France. Private Percy Blakeney wakes up. He is lying on fresh spring grass. He can hear birdsong, and the wind in the leaves in the trees. Where has the mud, blood and blasted landscape of No man's Land gone? Baxter & Pratchett - what a combination! The more I hear about this book the more excited I am to give it a read. The UK description is SO much more interesting to me than the US one. "Natural steppers" is a killer hook. The US version put me to sleep. A dry, dull fact at the beginning, and not much to go on. The second is a totally different book with a hook, and extreme interest from beginning to end. I'm not sure what the 1916 paragraph has to to do with the 2015 paragraph, though it still sounds exciting from the UK version. More character and theme development. You get a feel for the energy and excitement of what the book promises. The end of the US version seems to be more about the author and other books, rather than the current one. The Long Earth is an announced collaborative science fiction work.